He was The Grey Ghost. The Horse of the Century. 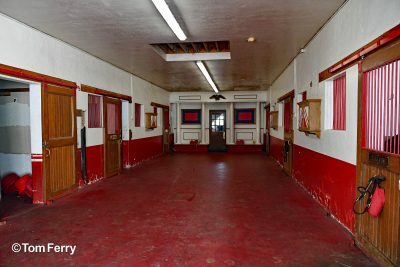 Greyhound’s original stall (photo courtesy of the USTA). 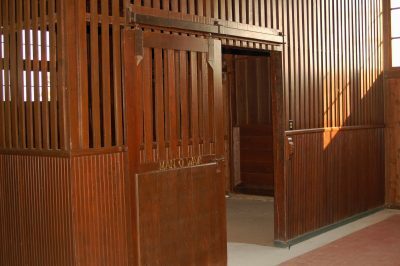 The oak walls of Greyhound’s stall were reassembled board by board (photo by Tom Ferry). Across his racing career, he established no fewer than 14 world records. At age seven, he effectively partnered with a female to set two of those records. He was an incredible combination of beauty and power. 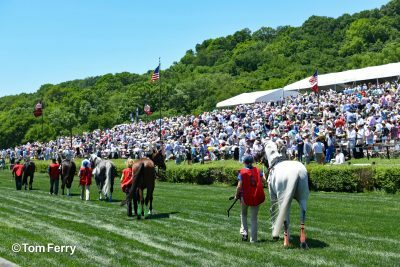 And after he retired to a small Illinois farm, visitors from all 50 states and more than 30 countries around the world came to see the gelding over the next 25 years. In the rich history of harness racing, there has never been a trotter quite like Greyhound. 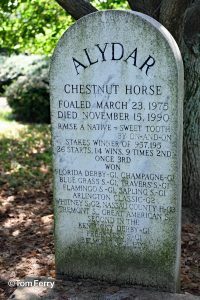 He was born in March of 1932 at Kentucky’s legendary Almahurst Farm, which also produced the great Kentucky Derby champion Exterminator. 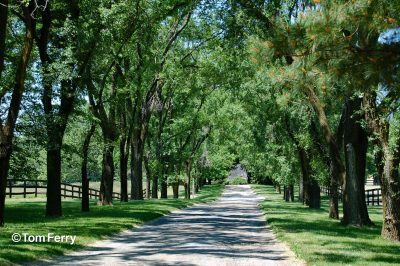 Today, the estate is Ramsey Farm, property of successful Thoroughbred owner Ken Ramsey and his family. As a yearling, Greyhound was consigned for sale at the Indianapolis Speed Sale in the fall of 1933. Even though America was in the thick of the Great Depression, Greyhound was sold to Colonel Edward John Baker for a respectable $900 (about $17,000 in today’s dollars). E.J. 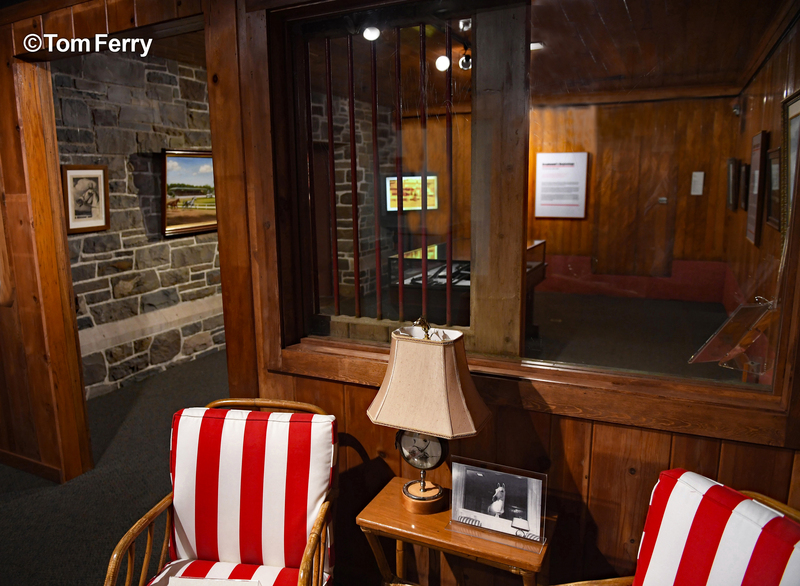 Baker was a native of St. Charles, Illinois and created Red Gate Farm just north of the city. The farm would ultimately become known for its talented trotters including Winnipeg, Labrador and Sister Mary. Greyhound showed promise during his two-year-old season, winning four significant juvenile races. His three-year-old season was highlighted by his victory in the sport’s most prestigious race, the Hambletonian Stakes in Goshen, New York. He dominated harness racing in 1935, winning 18 of his 20 starts. He was unbeaten in every race, with his only two losses coming in heats. For the remainder of his racing career, Greyhound would only lose one more race — as a four-year-old. The world records he broke were often his own; and many endured for more than three decades. In 1939, at age seven, he didn’t start in a race because there was no horse prepared to race against him. Subsequently, he ran in exhibitions against the clock. If Greyhound was the king of the trotters, the queen was Rosalind. The six-year-old mare won the Hambletonian in 1936, the year after Greyhound captured the title. In the summer of 1939, the two champions came to Syracuse, New York and were harnessed in tandem together and lowered the team-to-pole world record to 1:59. One week later, at the Indiana State Fair, they lowered their own record to 1:581/4. It was the closest thing to a love affair that horse racing has ever seen. Greyhound’s racing career came to an end at the close of the 1940 season. Across a six-year career he won 71 of 82 heats and 33 of 37 races, with three of his four defeats coming as a two-year-old. 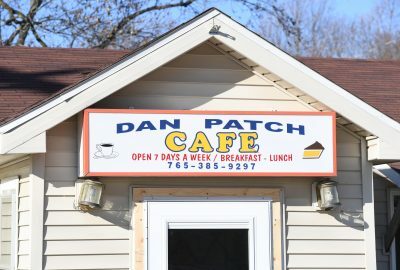 He retired to the Chicago area where he split time between Colonel Baker’s Red Gate Farm and Baker’s Acres in Northbrook. As he grew older, he turned nearly white and would tour racetracks across America adorned in his red blanket. In 1949, Greyhound moved to Flanery Farm in Maple Park, Illinois. 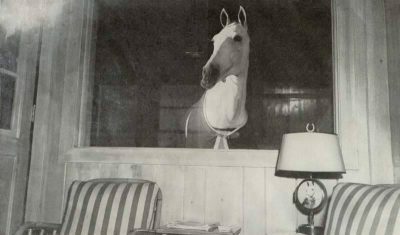 Baker loved the horse so much he built an elegant 12’ x 21’ tongue-and-groove, oak-lined stall, supplemented with air-conditioning, recessed lighting and a wide picture window overlooking an adjacent sitting room so Greyhound could lean through the opening and greet fans. 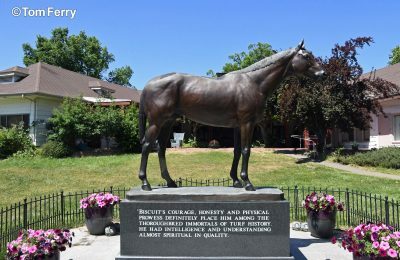 For nearly 25 years, the horse was loved and cared for by Dooley and Leona Putnam and his trainer Doc Flanery until the great champion passed away on Feb. 4, 1965 at age 33. 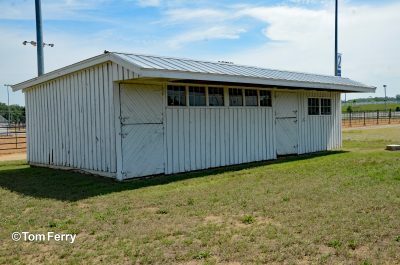 Greyhound’s original barn was reassembled at the Harness Racing Museum & Hall of Fame in Goshen, New York. 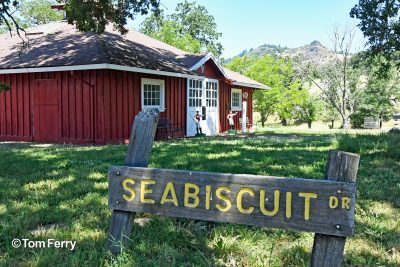 It was was opened to the public on July 2, 2017 (photo by Tom Ferry). 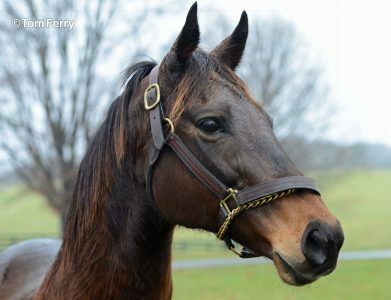 Long after Greyhound’s death, Flanery Farm remained in family ownership and the facilities were leased to other Standardbred breeders. 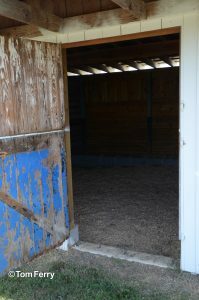 As time marched on, the legendary stall was kept intact — until 2013, when word spread that the farm, which had become run down, would be leveled. Two women from the area, Jan Heine and Nancy Brejc, had formed a lifelong friendship and had worked at Flanery Farm in prior years caring for horses of various lessees. Both in their mid-fifties by 2013, Heine and Brejc had developed an obsession with Greyhound over the years and kept tabs on his stall. Before the farm was razed, the women came to Flanery in the cold of November and spent a total of 193 hours over 11 days disassembling both the stall and sitting room, nail by nail and board by board. This included a few solid oak boards containing Greyhound’s tooth marks. The painstaking process included numbering each board as if it were a piece in a puzzle so it could be put back together exactly as it once had been. Every part was stripped down and packed safely away for the winter. In May of 2014, it was time for Nancy Brejc and Jan Heine to hit the road with Greyhound’s stall in tow. 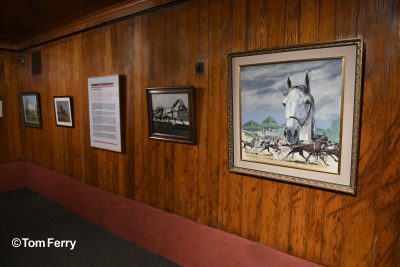 An 840-mile road trip was made to Goshen, New York and the Harness Racing Museum & Hall of Fame. 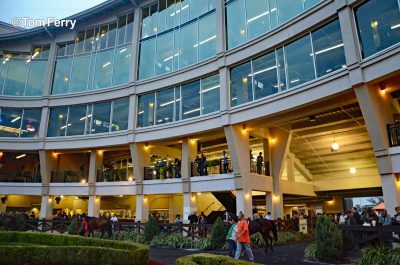 After a few years of planning and reconstruction, Greyhound’s rebuilt stall was opened to the public on July 2, 2017. I visited the museum on a trip to New York. 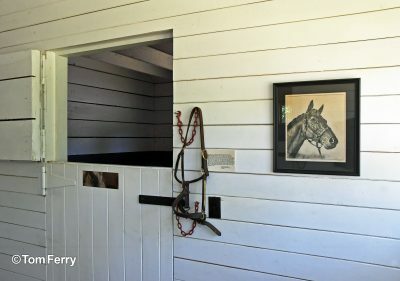 When I walked into the sitting room and then into the stall, I immediately felt a deep reverence for one of the most amazing racehorses that ever walked the earth. 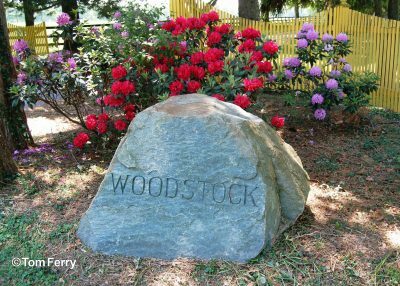 Beautiful haunting music played on a background video as the voice of his late caretaker Dooley Putnam reminisced about his longtime friend from a 1965 interview. 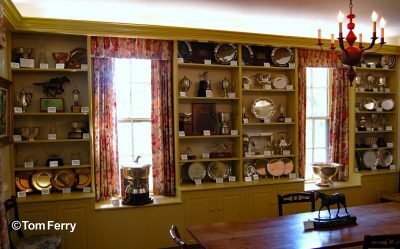 Artwork and photos lined the oak walls and Greyhound’s racing tack and various trophies and treasured mementos were also displayed. There must be some sweet pastured place. There is no city in America like New Orleans and there is no racetrack like the Fair Grounds. 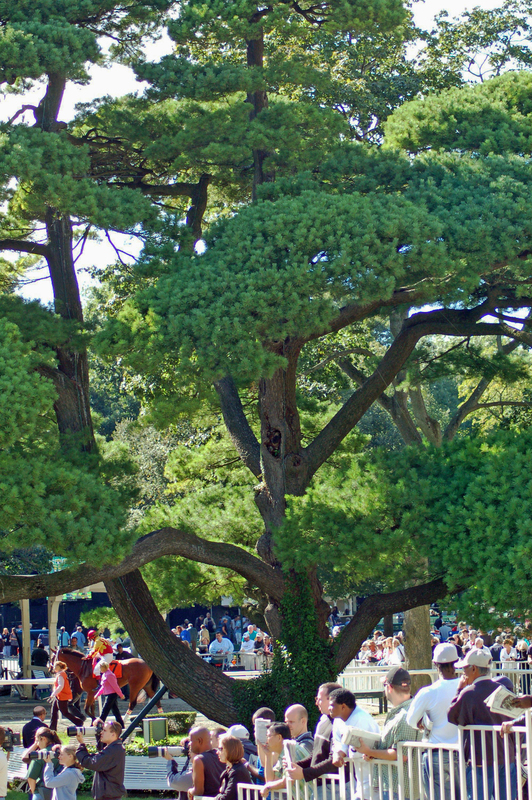 Located two miles from the French Quarter in the heart of the Crescent City, these beloved grounds have been a staple of southern Thoroughbred racing since 1872. Much like the spirit and resilience of the city and its people, the story of the Fair Grounds has been one of survival. 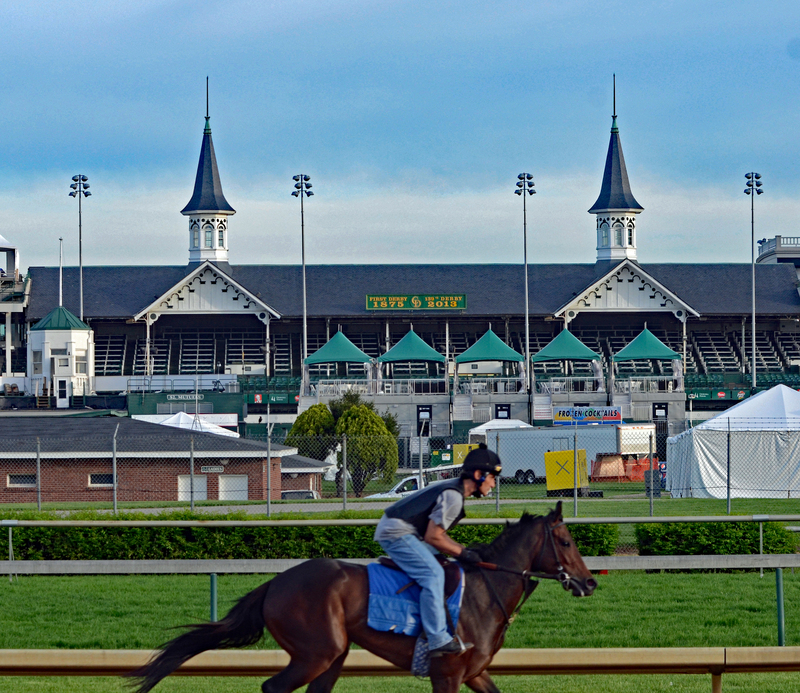 Across 150 years, the track has overcome the Civil War, two fires, bankruptcy and Hurricane Katrina. Yet, today, it prospers. The twin gatehouses at the Gentilly Blvd. entrance have been there since 1862 (photo by Tom Ferry). 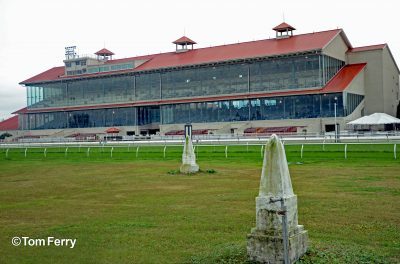 Technically speaking, the Fair Grounds is the second oldest horse racing track still in existence in America (after New Jersey’s Freehold Raceway, which opened its gates in the 1830s). Horse racing has taken place on this New Orleans’ real estate since 1852, when the facility was known as the Union Race Course. It closed five years later and re-opened in 1859 as the Creole Race Course. The name was changed to the Fair Grounds in 1863 and the first official race card and call to post occurred on April 13, 1872. The track has seen its share of historic and colorful characters over the years. During that first meet in 1872, General George Armstrong Custer was an owner with horses stabled on the grounds, four years before he and his men were killed at the Little Bighorn. 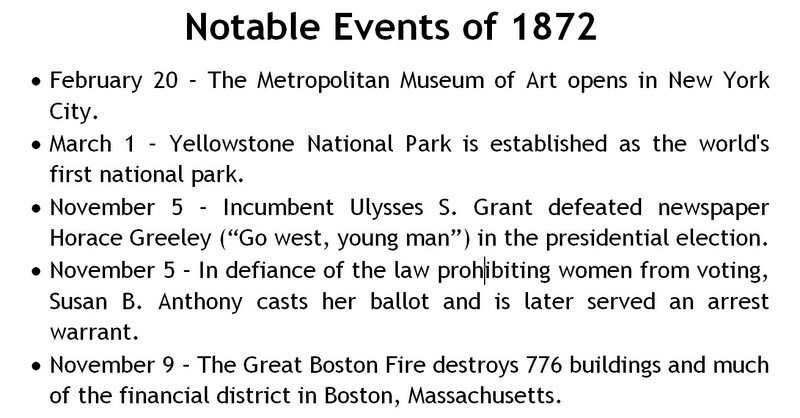 Four years after the conclusion of his presidency, Ulysses S. Grant attended the track’s 1880 spring meet. There were big personalities on the racecourse as well. 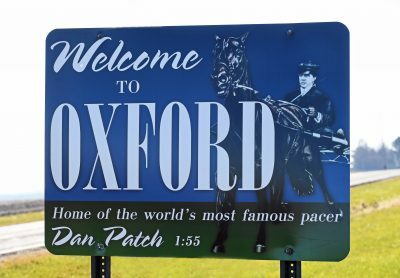 Winnie O’Connor, one of the sport’s first great jockeys, spent a good portion of his career at the Fair Grounds and was once suspended for discharging a pistol in the jock’s quarters. Many great horses have run at the track as well; however, three of them captured hearts of Fair Grounds’ racing fans unlike any other and are remembered to this day. The graves of the beloved Black Gold (center) and Pan Zareta (right) face the Fair Grounds grandstand (photo by Tom Ferry). There has never been a mare like Pan Zareta. From 1912 through 1917, she ran 151 times on 24 different tracks across America, winning 76 times. In fact, she finished in the money in 85 percent of her starts regardless of the high weights she often carried. She once toted 146 pounds in a victory, conceding 46 pounds to the runner-up. Pan Zareta was in training during her 8-year-old season when she died suddenly of pneumonia in her stall at the Fair Grounds. She was buried in the track’s infield. 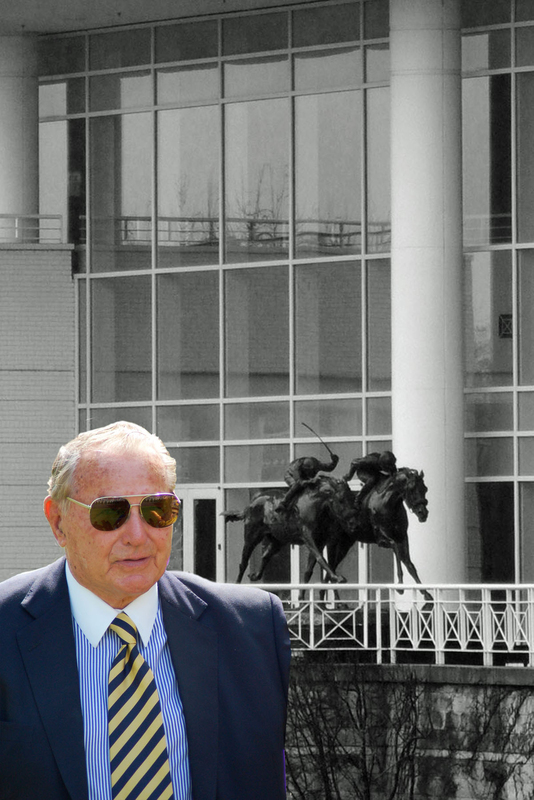 Six years after Pan Zareta’s passing, a young black colt put the Fair Grounds on the map once again when he won the 50th running of the Kentucky Derby. His name was Black Gold. In one of the most thrilling renditions of the Run for the Roses, Black Gold was bumped during the race’s final 70 yards and driven five wide but recovered to win at the wire. At age seven, tragedy struck during the Salome Purse at the Fair Grounds when the colt broke down in the stretch, finishing the race on three legs. He was euthanized at the track and heartbreak once again fell across New Orleans and the Fair Grounds. Black Gold was buried on the track’s infield near the sixteenth pole and close to his fellow Hall of Famer Pan Zareta. 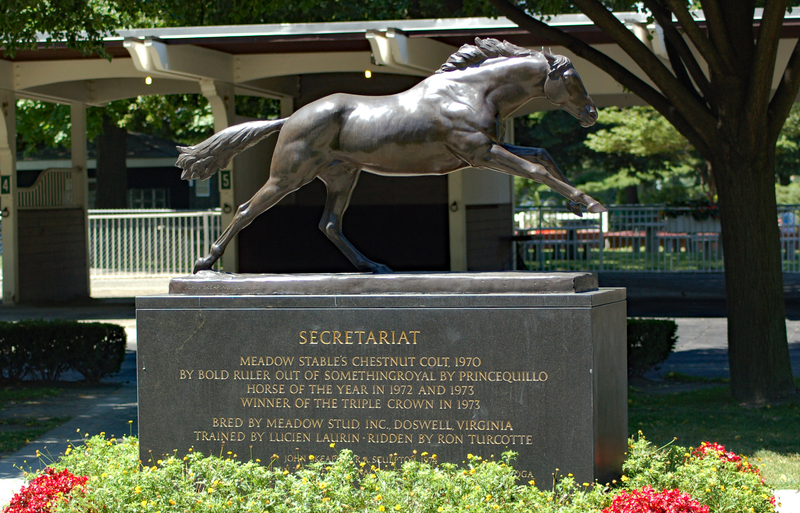 Each year, the Black Gold Stakes and the Pan Zareta Handicap are run at the race course and the winning jockeys place a wreath on the respective graves of the two legends. 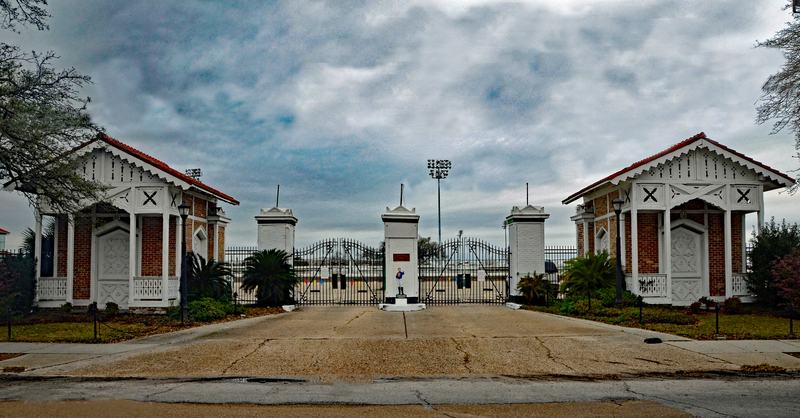 From 1977-1990, the Fair Grounds was owned by Thoroughbred owner and trainer Louie J. Roussel III. 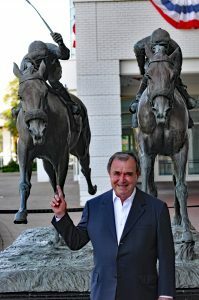 In 1988, a three-year-old colt owned by Roussel and popular New Orleans car dealer Ronnie Lamarque captured the Fair Grounds’ signature race, the Louisiana Derby. After a disappointing third place finish in the Kentucky Derby, Risen Star went on to capture the Preakness Stakes and then won the Belmont Stakes by a dominating 14 ½ lengths. 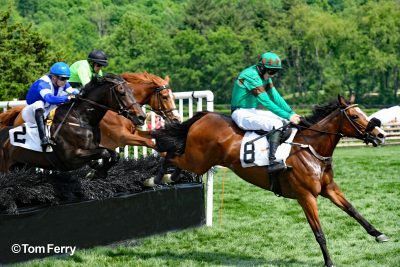 An injury that occurred in the Belmont resulted in his immediate retirement but he was awarded Champion 3-Year-Old Male honors at the close of the year. The Fair Grounds was home to five of Risen Star’s eleven career starts and he is remembered each year with the Risen Star Stakes for three-year-olds. 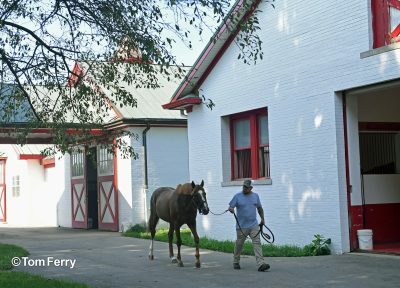 The glass-enclosed clubhouse overlooks a beautiful paddock at Fair Grounds (photo by Tom Ferry). 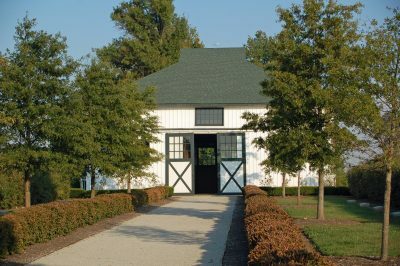 When visitors arrive at the Fair Grounds today, they encounter twin gatehouses built in 1862 that still stand at the track’s front entrance on Gentilly Boulevard. These remnants of yesteryear have survived the erosion of time that other track landmarks have not. 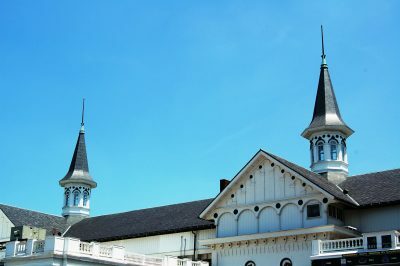 At least six different grandstands have been erected over the years. A fire at the track three days after Christmas in 1918 destroyed the grandstand; and another fire in 1993 destroyed both the grandstand and clubhouse. Hurricane Katrina hit in 2005 and the property was inundated with water and a section of the grandstand roof was torn off by the storm’s powerful winds. Once again, the Fair Grounds persevered and, after closing for a year, it was reopened in late 2006. The facility today is a celebration of glass. 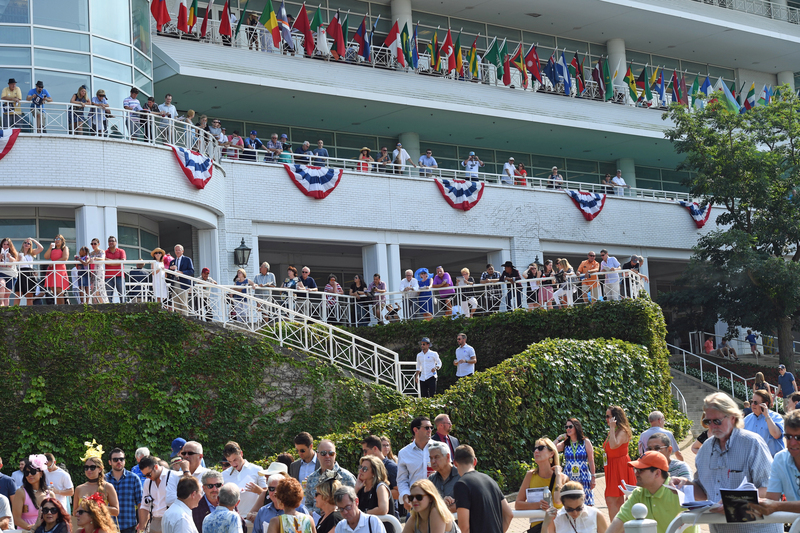 The grandstand structure is two stories tall, comprised mostly of windows and, as a result, each racing patron can see every point of the racecourse from their seat. Food at the Fair Grounds? Hey, you’re in New Orleans and the menus provide the cultural experience you would expect, including jambalaya, seafood gumbo, oysters, po’ boys and many other Creole delights. The Fair Grounds is also home to one of the world’s largest and most popular concert events — Jazz Fest. This annual celebration of the music and culture of New Orleans and Louisiana takes place over seven days in late April and early May. Spread across 12 different stages, the event drew a record 650,000 attendees in 2001. In the world of horse racing, there are few places as distinctively special as the Fair Grounds on Thanksgiving Day. While the annual racing meet begins in mid-November and runs through late March of the following year, for so many years the race course’s opening day was on the holiday. These days, Thanksgiving at the track has the feel of Mardi Gras in November. 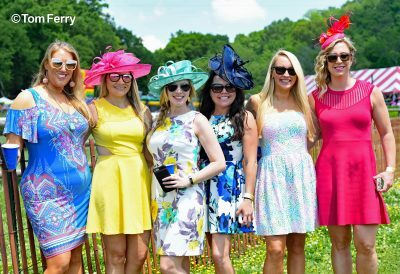 It is an equine costume party complete with Bloody Marys in a carnival-like atmosphere. Most importantly, the patrons that day skew heavily young and turn out in droves. They come to celebrate life and New Orleans and provide great optimism that this beloved track may be around for a third incredible century. 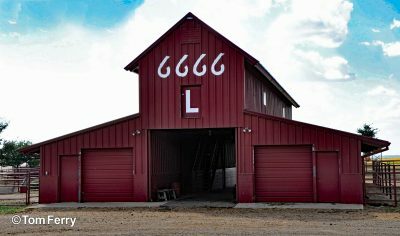 When I stepped foot onto the 6666 Ranch, I gazed up at a big, blue, beautiful Texas sky and couldn’t imagine it any other way — legendary Quarter Horses, a family legacy, superior Black Angus Cattle and oil. These are the hallmarks of this iconic landmark. 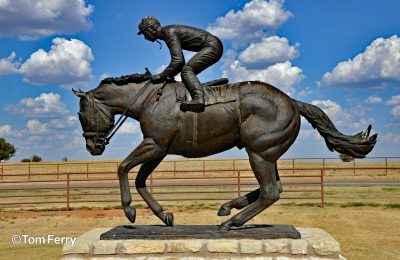 Also known as the Four Sixes, the ranch may well be the most important place in the history of American Quarter Horse racing.